The reports here summarise weather events and climate news, including a round-up of their media coverage. They are archived in the relevant day's Daily Weather Summary to help make it a more complete record of the day's events. Timeliness of the reports is entirely at the mercy of my available time so, for the most up-to-date information, make good use of my media links here. Massive rainfall in an unrelenting, stationary monsoonal trough across tropical north QLD brought severe flooding to the Townsville region in early February with over 3000 houses inundated. The rain also extended west across the Gulf Country to NW QLD where it was initially hailed as a godsend after a dry year that followed six dry or average years since 2011, but like the rain on the coast it went on and on, turning the country into an inland sea, killing an estimated half million cattle. In and around Townsville, rain increased from Sunday 27 to Tuesday 29 January as the monsoonal trough moved south into the area. On Wednesday 30 and Thursday 31, rain increased with gauges recording between 100 and 200mm each day. This culminated in four straight days of increasingly torrential rain with most gauges reporting between 200 and 250mm in the 24 hours to 09.00 on Monday 4 February. Most of Townsville's suburbs reported 1.4 to 1.6 metres of rain over the 12 days to 4 February. The heaviest falls were in the mountains south of the city, where the Ross River Dam is located, and those to Townsville's northwest where several stations reported over 2m of rain in 12 days including Upper Bluewater 2357mm and Paluma (Ivy Cottage) 2334. Townsville's main flood risk is from the Ross River in its central and southern suburbs and the Boyle River in the west. The Ross River Dam was built both as a water supply and to offer flood mitigation for the city. As the incessant rain continued, the spillway gates were progressively opened higher and higher. Then, in the six hours to 1500 on Sunday 3 February, Woodlands Alert, a raingauge on the western side of Lake Ross, reported 302mm, helping push the level of the impoundment to just under 250% of its normal water level. With no more flood storage available the decision had to be made to follow the flood operations plan and open the gates to their maximum. The discharge, which had been high before, was now increased to the full 1900 cubic metres of water per second flowing downstream into Townsville suburbs. The area where floods were entering houses in Townsville gradually increased during the early days of February, but reached a maximum as the gates were opened. This level of water in Ross River Dam and extent of flooding had not been experienced before, so, with the BoM predicting further very heavy rain overnight into Monday, authorities were uncertain as to how widespread the flooding would be. Worst-case scenario modelling indicated that up to a quarter of the city's 82,000 homes could be affected by floodwater, so authorities voiced fears that 10,000 to 20,000 houses may be affected. Extraordinarily strongly-worded warnings were issued by the BoM and QLD Police. Fortunately, however, rain eased. As of 11 February, damaged houses around Townsville were still being identified, but Townsville City Council reported that 3,021 had suffered damage in the flooding: 1879 with minor damage, 1009 moderate and 133 with severe damage. Townsville received its record rain from a stationary monsoon trough that pushed constant rain in from the Coral Sea, day after day. The same monsoon trough lay across Queensland's Gulf Country, but with the addition of a deep low, shown in this weather map for 04.00 EST on Sunday 3 February. The monsoon trough brought widespread rain across the Gulf Country which also pushed south across the low divide into rivers, such as the Diamantina, that flow SSW towards Lake Eyre. However, the deep low north of Mt Isa, which barely moved over eight days from Wednesday 30 January to Wednesday 6 February, brought rain of an intensity seldom seen in the area. Several towns and cattle stations recorded daily totals of 200 to over 300mm. The heaviest rain fell over eight days from 29 January to 5 February with the heaviest totals in the Leichhardt and Flinders River Basins. Because rain fell in thunderstorms and heavy rain areas around the low, totals were extremely variable with some locations recording 8-day totals only around 200mm while others exceeded 600mm due to several days of torrential rain. Gereta Station, 85km NNE of Mt Isa, which had the misfortune to be almost directly under the low for most of the time, recorded 720mm over the 8 days, 232mm of which fell in 24 hours to 09.00 on the 3rd. Jubilation at the breaking of the drought in NW QLD soon turned to dismay as inland seas grew larger, stranding and bogging cattle and making it nearly impossible to drop food to them, or for them to reach the food anyway. Cattle caught up against fences in deepening water soon died of exposure as estimates of livestock losses mounted. Around half a million are believed to have died. BoM 8 Mar: Special Climate Statement 69—an extended period of heavy rainfall and flooding in tropical Queensland The Bureau's detailed analysys of this event. Intense fires are burning deeply into Tasmania's Southwest National Park. In this view of hotspots from NASA's Terra and Aqua satellites at 15.00 EDT today, Lake Pedder is in the top left corner while the brown-grey rocky peaks of the Western Arthur Ranges run WNW to ESE from the centre left of the image. On the right, the fires burning in the area west of Huonville dominate the scene. Incident Alert. Many tragedies are unfolding in the tense fire situation in TAS on Wednesday night 30th where over 500 firefighters confront nearly 1,500km of fire fronts. At 18.00 EDT, 12 fires were at emergency level and another 12 at watch and act. Three of the emergency level fires are on the Central Plateau and the other nine in the Huonville area in the south of the state and to its west. Six houses have been lost, three on Tuesday 29th in the Glen Huon area 10km W of Huonville. Many main roads have been closed at various times including the Lyell Highway, Highland Lakes Road, Huon Highway, Strathgordon Road and others in the south, centre and west of the state. Power has been cut in bushfire areas for safety reasons and water use restricted to be available for those fighting fires. A cool but virtually rainless change began making its way across the island during the afternoon, swinging the wind from NNW to W, after which the wind became lighter but erratic. This was being watched nervously, as such a wind change can rapidly turn smaller fire fronts into much longer ones pushing in an entirely new direction as described in this ABC Explainer. So far, no news on this. The main fires are burning west of Huonville along Riveaux Road, which extends to the edge of the Tasmanian Wilderness World Heritage Area. Andrew McGuiness of the Tasmanian Fire Service told ABC News that the Riveaux Road fire had started "creeping around the outskirts" of Federation Peak. "Highly likely what's happening there is that fires are taking runs through gullies and valleys ... and then they're running into wet forest and then sort of poking around in that wet forest. It doesn't look like it's taken a run through Federation Peak at the moment, but it's certainly threatening that area." This informative ABC article carries a dramatic photo looking across the Federation Peak area to the Riveaux Road fire. The most lasting impact of these fires will be damage caused to the fragile Alpine vegetation and valley rainforests in the Heritage Area. These are ecosystems unused to fires and for the most part unable to recover from them. This is a precious area, home among other things to the recently discovered tallest living hardwood tree in the world, second only to the softwood sequoias of California. It is the world's tallest flowering plant. Hotspot imagery indicates fires are already burning up the valleys leading into the Western and Eastern Arthurs and spotting along valleys south towards Federation Peak and Precipitous Bluff near the South Coast. These are areas well known to bushwalkers, including myself, who will be anxiously watching the efforts being made to control them by water bombing aircraft. Most things can be replaced. Lives, and this unique environment, cannot. BoM issues Special Climate Statement on ongoing heatwaves. Thu 24 Jan 2018 The Bureau of Meteorology has issued an updated Special Climate Statement (SCS) bringing its coverage of the prolonged heatwave gripping much of the country up to 20 January. Bureau SCS's are very detailed analyses of major events, usually ones that cover multiple states or territories. As you will know if you follow the records sections in AWN's Daily Weather Summaries, the sequence of heatwaves that began in early December and shows no signs of abating has been unprecedented in many respects. The SCS details these, looks at the heatwaves so far, examines the climatic drivers causing them and provides a comparison with past heatwaves in Australia's history. Widespread heatwaves during December 2018 and January 2019 is available here (pdf), and a list of all SCSs is here. Records fell again in the NT, SA, VIC and NSW as another pulse of heat crossed the country between Wednesday 2 and Saturday 5 January extending heatwave conditions across the SE quarter of the continent. On Thursday 3 January, Central Australia and much of SA roasted once more, setting all-time records for heat in The Centre and in some cases breaking records set only five days ago. Alice Springs Airport equalled the 45.6° all-time record set on 29 December, but elsewhere in The Centre and western SA temperatures pushed into the 46s and 47s. Top temperatures were an all-time record 47.4° at Walungurru near the WA/NT border W of Alice Springs and 47.1 at Ceduna Airport on the coast of the Great Australian Bight, 18.4° above average. Alice Springs Airport had nine days between 27 December and 4 January when top temperatures exceeded 43.0°, the longest run of consecutive days over 43.0 in nearly 80 years. Previously, the longest run was four, in 1960 and 2004. Up to Friday 4 January, the Airport recorded temperatures over 45.0 only five times, three in the previous week. On Friday 4 January, the trough and frontal system ducting hot northwesterly winds before it brought maxima over 45° to most of eastern SA, SW NSW and NW VIC. Many locations in VIC registered their hottest January day on record with Walpeup in the state's west highest at 46.6. That was just 0.6° shy of the state January record of 47.2 set in Mildura in the lead-up to the 1939 Black Friday Bushfires. Major centres didn't fare much better with Mildura recording 46.4, Albury 43.7, Bendigo 44.5, Hobart Airport 35.6 and Melbourne Airport 43.4, a sizzling 16.9° above average. The cold change when it came through Melbourne couldn't be missed: the temperature at Olympic Park in central Melbourne dropped 15.3° in 10 minutes, settling over 25° below the maximum. In TAS, a dramatic orange/brown pall of smoke was cast over Hobart from the Gell River fire, burning in inaccessible country NW of Mt Field National Park. The fire had burnt through over 150 sq km by Saturday 5th as 17 other fires burnt in the state. In VIC, while rescuing kids from locked cars and people from being drowned at beaches kept emergency services busy, major fires burned at Rosedale, near Sale, and Strathbogie, SE of Euroa. Reuters and the ABC said that by Saturday 5th the Rosedale fire had burnt more than 100 sq km, and CFA helicopter photos showed the dramatic extent and intensity of the fire. Nearly 200 bushfires burnt across the state during Friday 4th. By Saturday 5 January, the trough was moving through NSW pushing the heat NE towards QLD. Minimum temperatures were high enough in the Central West and on the SW Slopes to set new January record warm nights at stations with 15 tp 25-year histories, though Tumbarumba had its highest January minimum in 52 years with 25.9°. Many inland locations didn't see the temperature fall below 30. As often happens ahead of a front, Sydney had a hot day with maxima of 40.3° both at the Airport and Richmond, while Newcastle also sweated with a maximum of 40.9 at Williamtown. 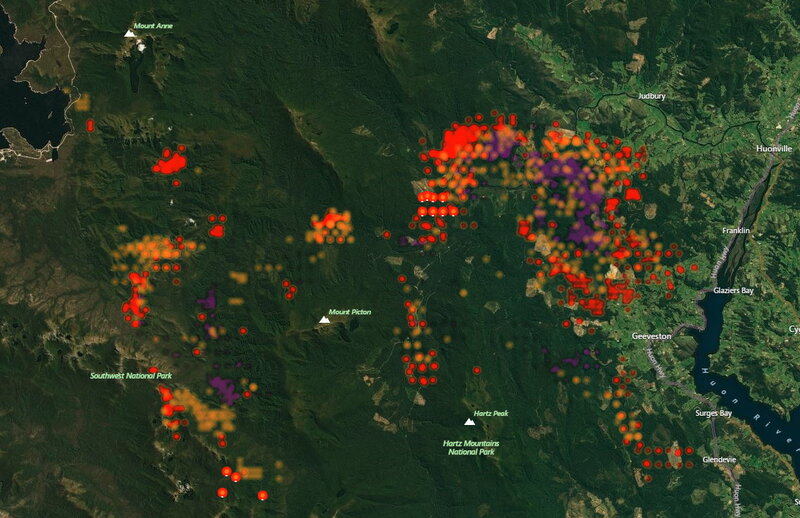 An imposing line of thunderstorms moved across NSW to finish the day, bringing cooler southerlies but also the risk of lightning-ignited fires. A fire at South Maroota in outer NW Sydney earlier threatened houses. The huge heat dome covering large parts of the continent continued to affect the WA Interior, and moved into Central Australia to give Alice Springs Airport the hottest day experienced there in nearly 80 years. Also, on Saturday morning 29th, the Snowy Mountains and much of the Murray Valley sweltered with minimum temperatures the warmest for December in decades. Full records are in the AWN DWS for today. Alice Springs recorded a top temperature of 45.6°, the all-time highest at the Airport station since it opened in 1941. The previous all-time record was 45.2 in January 1960 while the hottest December day was 44.2 in 1972. 275km S of Alice Springs on the Stuart Highway, almost on the NT/SA border, Kulgera equalled its all-time highest temperature on record (45.5°, 40-year history), while Curtin Springs (46.0°, 53 years), Yuendumu (44.8, 46 years) and Yulara (46.0, 31 years) all had their hottest December days. Weather records at The Alice go back a long way for such an isolated location. Because a telegraph repeater station was established there in 1871, a weather station was set up only seven years later transferring to the Post Office site in town in 1932. The highest temperature recorded before observations moved to the Airport was 47.5° at the old Telegraph Station on 24 December 1891, 1.9° higher than today's new record. But there's a but. This photo of the Telegraph Station taken in 1880, two years after the weather station was established, shows how it was encircled by ridges of the MacDonnell Ranges. The temperatures are believed to have been taken in a Stevenson type screen, and it's known the screen was surrounded by a 1m high rock wall painted white. Both the surrounding wall and the nearby ridges would have reflected heat and interrupted wind flow creating a suntrap effect at the site. The Airport, however, is on an open plain 12km S of the city and 8km away from the MacDonnells. It is likely that the old Telegraph Station site was a warmer one than the Airport, but as the two stations never operated simultaneously to allow comparisons, we can only speculate whether today's Airport record would have beaten that of the Telegraph Station in a fair fight. Elsewhere, people in parts of the Murray Valley had one of the hottest nights they've known, but a "cool" front moving through during the day gave more modest daytime temperatures in the mid to high 30s. Hume Reservoir just east of Albury had its warmest-ever night with a low of 28.4° in 55 years of observations, while Griffith Airport's 31.0° was its highest in 48 years. Six other stations set new December records including Thredbo and Cabramurra. Older items are archived in the Daily Weather Summary. Use the index to find them.